What is Max's Beta Pump? The most innovative and complete Muscle hypertrophic compound currently available! Created by leading Australian sports science experts and elite athletes through hours of testing and evaluation, Maxs Beta Pump gives you mind blowing muscle pumps, Intense long term energy, euphoria, focus and zero water retention, keeping you lean, hard and stronger longer! Beta Pump is built from cutting edge ingredients that help boost your focus, strength and muscle endurance! The Uniquely developed formula featuring precise amounts of AAKG, Beta Alanine and Beetroot extract helps deliver vein-popping pumps with maximum vascularity that will elevate your workouts to a level you've never been! Buy Max's Beta Pump Premium Pre Workout from Fitness Market and save! With our efficient dispatching and quick delivery throughout Australia, Max's Beta Pump Premium Pre Workout can be yours sooner. 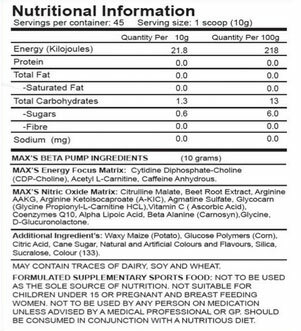 Below you can rate and add reviews for Max's Beta Pump Premium Pre Workout.